At the school I work at we have a RRP Mendel. I was trying to print some students work but it kept failing. Eventually I discovered that the problem was down to curling from some overhangs on one piece. As the part had 45degree angle and only 5mm thick, the printer was catching on the curled ands and eventually cause the printer to miss some steps. I needed a way of cooling the plastic faster. I then found an 80mm computer case fan that was being recycled. 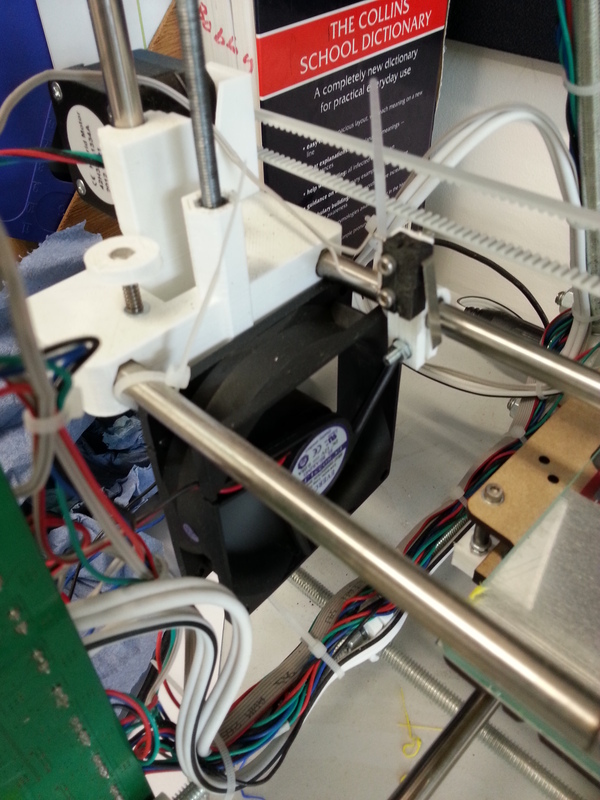 As I needed to get the part printed I simply cable-tied the fan onto the smooth rods of the X-Axis. Amazingly these are about 80mm apart and the fan fitted beautifully behind the X-Axis endstop. Now I was able to get the print to finish and have a great look as well.